The Beeminder Android app can show you your goals, let you enter data, and send you Android notification reminders. You can also set up widgets to get a quick view of your progress on your home screen. How do I add data to my goal? Tap the goal in your goal list to open it in the app. The data entry fields are on the bottom half of the new screen. Check that the date and value are correct — you can use the +/- stepper buttons to adjust, or tap the fields to edit them directly. Add a comment if you want, then press Submit to send it to Beeminder! The graph image will refresh, and the bare minimums and color will update if they've changed. The Android app also lets you submit data using an in-app timer or an in-app tally counter (especially helpful for Odometer goals). Swipe left or right on the data entry fields to switch entry methods. Can I use the timer feature to submit minutes instead of hours? Nope, right now it only submits hours. If you want to use it on a goal that's already using minutes, you can scale the units on the existing goal. We recommend always measuring time-based goals in hours and using the colon shortcut to enter, for example, 45 minutes as "0:45" which Beeminder interprets as 0.75. How do I refresh my data in the app? For goals and the goal list main screen, tap the ♺ icon to fetch the latest goal status from Beeminder. To fetch the latest data for an autodata-integrated goal, press the Fetch New Data button below the graph image on the goal screen. My goals aren't updating / my data isn't being submitted to Beeminder. First, check that you're connected to the internet successfully. If you're using an app that disables WiFi or data after certain hours, it may be blocking your goal updates! Last, try logging out of the app and then logging back in to force a full refresh of the cached data. If goal information is still not updating properly, contact support. 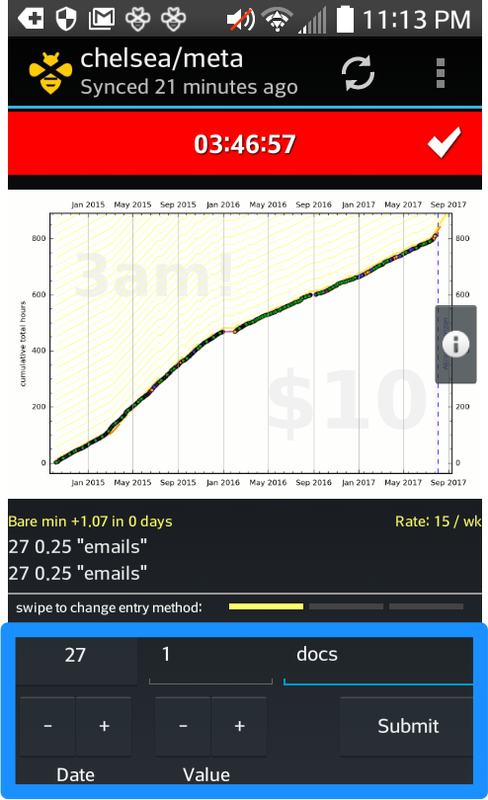 My goals show up as derailed on the app, but I didn't get an email and they look fine on the site! Your app data is stale and out of sync. Try the solutions in the questions above to refresh it! How do I enable Android reminders? Tap the ⋮ icon in the upper-right corner of the main screen and select Settings. Make sure that Enable notifications is checked. You can also edit the sound played and whether or not the phone vibrates with each notification right below that. My Android reminders don't seem to be working anymore. First, try switching the notifications off and on again. Completed, archived, and/or deleted goals are showing in my goal list. To refresh the goal list screen, tap the ♺ icon near the top right of the screen. 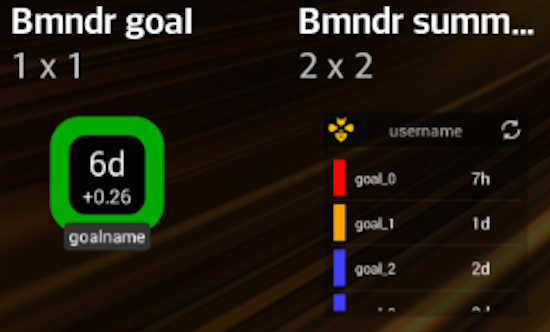 If the offending goals don't disappear, you can force a brand new sync by signing out and back into the Beeminder app. Finally, if neither of those work, deleting and reinstalling the app should clear them out. What do the Android widgets do?